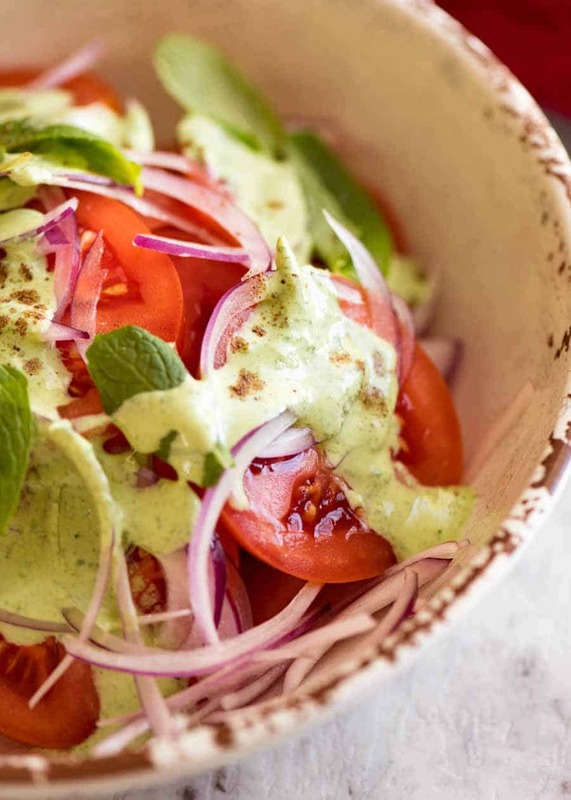 This is a wonderful refreshing Indian salad that pairs really well with rich, spicy curries. 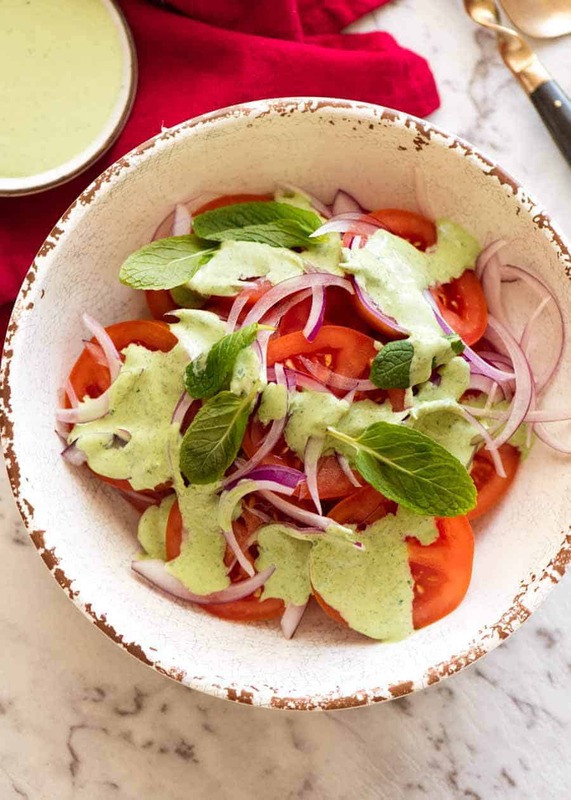 Made with slices of juicy tomato, scattered with red onion, and drizzled with a mint dressing, then finished with a small pinch of garam masala. Serve this on the side of any Indian mains! 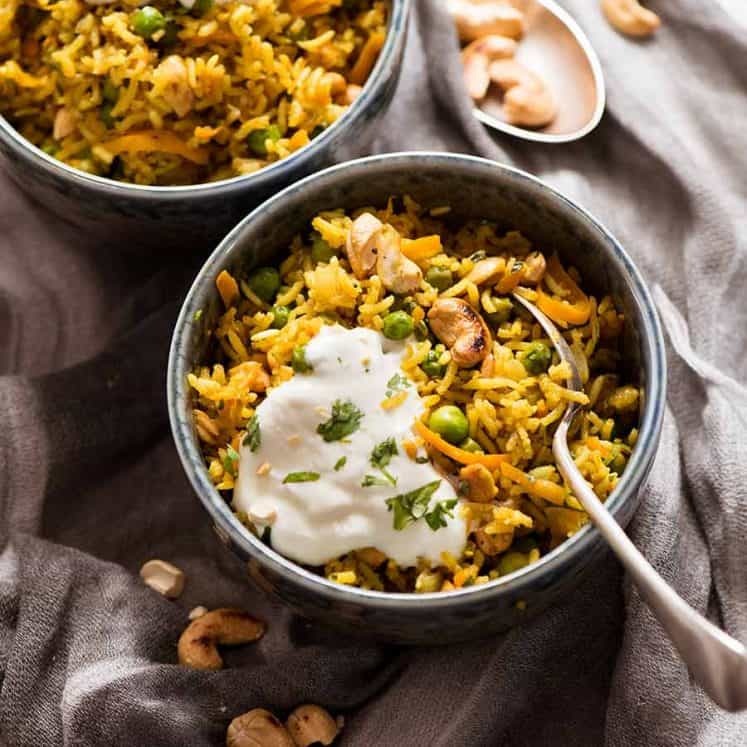 I feel like curry fanatics outside of India are familiar with well known Indian favourites like Butter Chicken, Tikka Masala and Biryani, but aren’t so familiar with Indian sides. 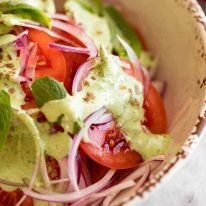 Given that I’ve embarked on a bit of an Indian curry mission, I’m going to share a handful of quick and easy vegetable sides for curries – starting with this Indian Salad with Tomato and Mint Dressing. Refreshing is the key here. Curries are flavour loaded and often quite rich, so we fresh sides are ideal! The dressing here is simply Raita, thinned down slightly with water so it’s pourable. Raita is often served with this consistency anyway, rather than being thick and dollop-able. An ideal refreshing salad to serve on the side of rich spicy curries! 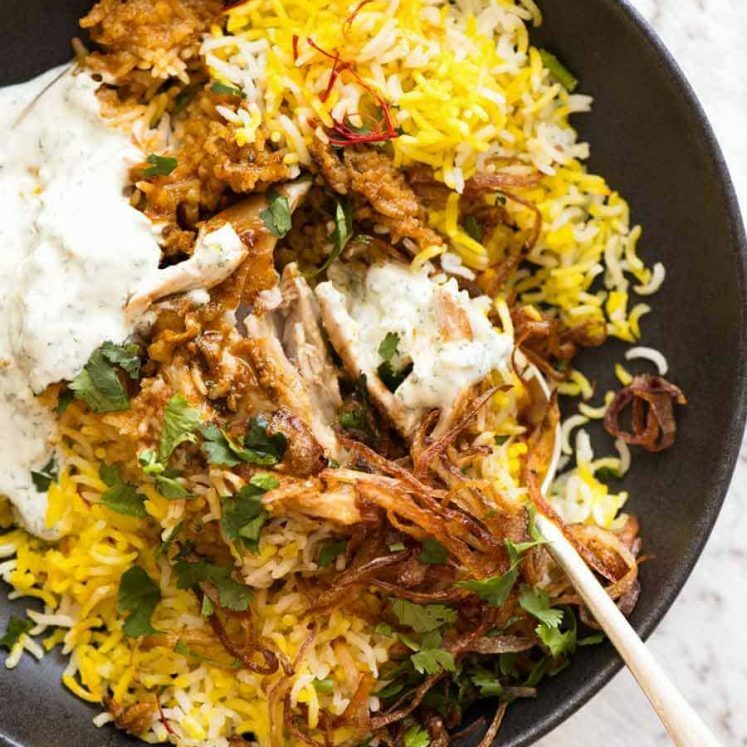 The dressing here is simply Raita, a mint yoghurt sauce often served on the side of curries. Blitz ingredients in a food processor until it becomes a smooth, bright green sauce. Use extra water to thin to a pourable consistency. Put the tomatoes in a bowl. Sprinkle with pinch of salt, mix with your hands and leave to rest for 10 minutes (extracts a bit of juice, makes them juicier). Drain the tomatoes. Mix with the onion in a serving bowl. Drizzle dressing over the tomato salad. Sprinkle with a pinch of garam marsala if desired. Raita is typically a thin, pourable consistency, whether used for dressing or as sauce. Recipe makes more dressing than you need for this salad because it's hard to make less in a food processor so serve leftovers with the main. Nutrition assumes 1/2 cup of the Mint Dressing is used for the salad. Awwwe! 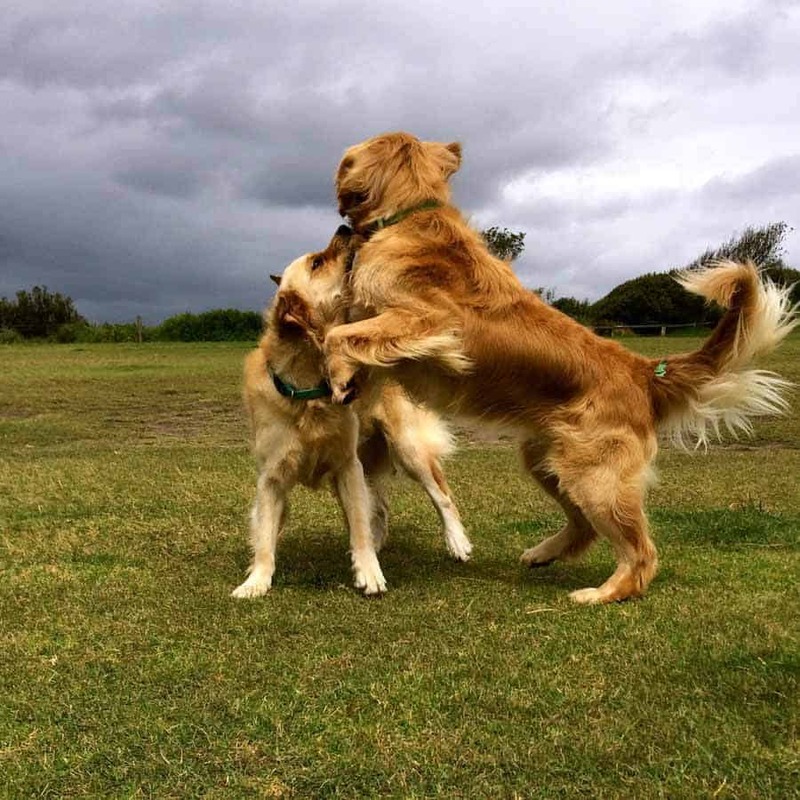 Dozer has a friend! Now is it female or male friend?